Matthew Day Jackson, August 6, 1945, 2010, burnt wood and lead on two wooden panels, 96 x 123 3/4”. Matthew Day Jackson pieces together history in two concurrent shows, one in SoHo (“The Tomb”) and another in Chelsea (“In Search Of”), which form a coherent presentation. Relentless in unraveling and rearticulating humanity’s past, Jackson employs meticulous research not to determine the historical record but to engage viewers. 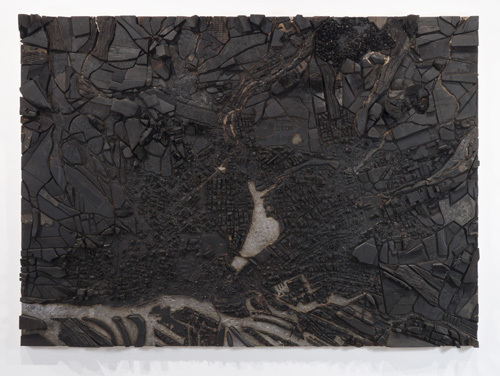 His Chelsea show includes a wall piece, August 6, 1945 (all works cited, 2010): a burnt topographical map. Its title is resonant, marking the day “Little Boy” was dropped on Hiroshima. However, the map is of another city, and the piece is from a series whose works all share the same title, implying that the bomb exploded across the world as nuclear targets multiplied. The thread that thematically informs both shows is a thirty-minute video, In Search Of, which begins with the narrator intoning: “Since the beginning of time . . . the history of man is the history of the pursuit of his own image.” Jackson makes it his mission to investigate this statement, often via the concept of anthropomorphism. His thesis is connected—by the scientists interviewed in the video, and by Jackson as narrator—to artifacts and materials such as an Eames leg brace, biomedical prototypes, salvaged wood, metal bars referencing R. Buckminster Fuller’s geodesic domes, and mirror glass like that employed by Dan Graham. Jackson is an interdisciplinary thinker, touching on science and technology as much as anthropology and art history. He specifically uses his own body, casting his hands and feet and attaching them to tool handles to form the appendages of the figure in The Tomb, as seen in SoHo. Far from being macabre, Jackson’s work finds hope in progress, and is distinctly American in its idealism. This exhibition is also on view at Peter Blum SoHo, 99 Wooster Street, until November 13.